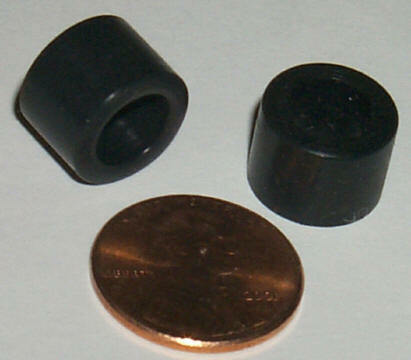 TJet replacement guide pins, black, high quality. Price $1.00 each. TJet silicone replacement tires, black, for standard small TJet rims. Good for traction improvement when pressed onto rear hubs. Tuff Ones black silicone rear tires, replacement press on tires give good traction improvement, while maintaining a low center of gravity. Price $2.00 per pair. AFX silver plated pickup shoe springs, work okay for TJets as well. Price $1.50 per pair. AFX rear axles, complete card of 12. These axles have rust on them, but appear to be usable, or nice as a display item. The top 3 blisters are pushed in somewhat. Can also be used for Tuff Ones or TJet-truck hubs. Price $10.00 for the card. TJet replacement brushes, unused. General purpose of average quality carbon brushes. Limited quantities available. Price $3.50 per pair. AFX silver slotted brushes, new old stock. These are for the original non-magnatraction standard or specialty chassied AFX cars. Very limited quantities available. Price $4.00 per pair. Matchbox replacement silicone rear tires. These will get your Matchbox slotless and slot cars gripping the road again. They will also work on Ideal TCR rear hubs with a bit of overhang and flare on the outer wheel edges. Price $4.50 per pair. TJet Hot Rod/Truck black silicone tires. These replacement press-on tires give good traction improvement. Price $2.00 per pair. O-Scale black silicone rear tires. Replace your dried-out O-scale tires with these double width tires which press-on to standard Aurora O-guage hubs for an instant big traction improvement. Price $5.00 per pair. AFX black silicone replacement rear tires. These press on to standard AFX or Magnatraction or Tycopro rear hubs for a nice tight fit and give new life for all your cars that have dried up old Aurora rubber. Can even be used on G-Plus if you don't mind a little narrower than original tire. TJet ribbed silicone replacement tires, black, for standard small TJet rims. Good for traction improvement when pressed onto rear hubs, with more realistic TJet tire appearance. AFX silicone replacement front tires. These press on to replace your worn out or missing AFX front tires. Smooth-walled, no 'Goodyear' logo. These can also be carefully stretched over a Tycopro front wheel giving a tire profile that flares towards the outer edge. Price $1.60 per pair. Faller early can motor, unused. These may be a little dirty or have some corrosion to the brass motor can in spots, but are unused old stock, and run. We have 2 variations. Once comes with a worm pinion gear and usually has bare steel laminations. The other type has no pinion gear and usually has blue factory painted laminations. Price is $7.00 with gear, or $6.00 for the non-gear type. TJet black rubber o-ring tires, low cost replacement low-profile press on tires give fair traction, while maintaining a lower center of gravity than stock tires. These measure about 5/32" i.d. by 11/32" o.d. They also make an excellent replacement for AFX front tires, with a tight fit when stretched onto the AFX front wheels. Price 75 cents per pair. TJet burnt orange silicone o-ring tires, low cost replacement low-profile press on tires give good traction, while giving the chassis a lower center of gravity than stock tires. These measure about 5/32" i.d. by 11/32" o.d. Price $1.00 per pair. TJet large black rubber o-ring tires, low cost replacement low-profile press on tires give fair traction, while maintaining a lower chassis center of gravity than stock tires. These will fit the larger TJet hubs commonly used on hot rods, indy racers, and gran prix racers, but giving a somewhat smaller outside diameter. They can also be used for a low-cost AFX front tire with a slightly larger outside diameter. They measure about 1.4" i.d. by 7.16" o.d. Price 75 cents per pair. Riggen front o-ring rubber replacement tire. These will slip over those Riggen HO front wheels with a slightly smaller than stock look. They measure about 1/4" i.d. by 3/8" o.d. Price 75 cents per pair. AFX Magna traction hop-up kits, by Auto World, 'powerkit X-1'. Include 1 pair magnatraction pickup shoes, 1 pair pickup shoe springs, 1 pr brushes, 1 steel guide pin, 1 pair of 5/16" wide silicone rear tires, and instruction sheet. Mint on card, cards may have some dents in blister. Tyco Curvehugger chassis, mint unused condition from the late '70s, ready to run. Will fit most Tyco snap-on type bodies. These are non-lighted. Tires may have some cracking but still grip fairly well. Price $34.00 each. Tyco HP7 chassis, mint unused condition from the early '80s, ready to run. Will fit most Tyco snap-on type bodies. Choice of non-lighted @ $27.00 each, or lighted @ $29.00 each. AFX silver plated pickup shoes, for standard AFX chassis. Unused. Price $2.50 per pair. Not currently available. Matchbox front wheels, tires, and axle set. Original old stock Matchbox parts, new on blister card. Price $3.50 per card. Matchbox rear wheels, crown gear, and axle set. Original old stock Matchbox parts, new on blister card. Price $4.50 per card. Only 2 cards available. See page 3 for more AFX, Magna Traction, G-plus, and Speed Steer parts! Ideal TCR pickup shoe springs, bag of 3 springs, mint in sealed package, from 1978. Tyco 440x2 chassis, used running condition from the late '80s to late '90s, ready to run. Will fit most Tyco snap-on type bodies. Rear tires may be somewhat dry, depending on availability. 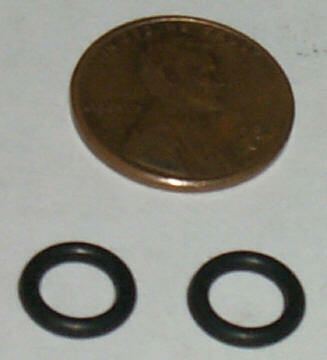 Price $12.00 each for narrow type which fit Indy cars, etc., or $15.00 each for wide style pan chassis, not shown. AFX standard non-magnatraction chassis, used with running motor, from 1971-1974 era, ready to run. Rear tires may be dry, and front tires may be o-rings, depending on availability, our choice. Price $20.00 each, or $19.50 each with new silicone rear tires added. AFX Magnatraction chassis, used with running motor, from 1974-1983 era, ready to run. Rear tires may be dry, and front wheels and tires may narrow or wide type or o-rings, depending on availability, our choice. Price $18.00 each, or $17.00 each with new silicone rear tires added. AFX G-plus chassis, used with running motor, from 1975-1983 era, ready to run. Rear tires may be dry or have used silicone tires, and front tires may be o-rings, depending on availability, our choice. Price $20.00 each, or $22.00 each with new silicone rear tires added. Tomy AFX Super G-plus chassis, used, from the '90s to present era, ready to run. Front and rear wheels and tires may be originals or aftermarket, depending on availability, our choice. Usually available in very limited quantities, if at all. Price $19.00 each. Aurora TJet chassis, used, from 1963-'70 era, ready to run. Rear tires may be silicone, depending on availability, our choice. Price $28.00 each for standard small wheel/tire type shown, or $30.00 each for large chrome wheel/tire type used on dune buggys, Indy racers, etc. Add $1.00 for 2 aftermarket body screws and 1 guide pin to mount the chassis.